Early in the nineteenth century Yankee farmers poured into this area, soon followed by Yankee peddlers and traders, merchants, craftsmen, teachers and ministers. Clergy trained in New England spread Yankee culture through congregations and colleges in the Western Reserve. Oberlin was one of those colleges in the New West founded on the dream of New England ministers to build here a new nation and a new world. The earliest settlers in Oberlin held religious meetings, and records tell of a sermon preached to fifty local farmers on May 19, 1833. 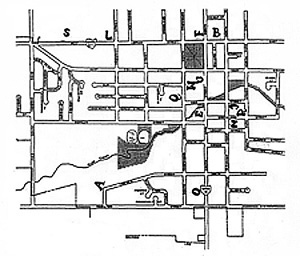 The following is a map showing the locations of Oberlin's churches. Click on the map to enlarge it!! A = Christ Temple Apostolic Church, 370 Lincoln St.
B = First Baptist Church of Oberlin, 44 E. Lorain St.
C = Christian Missionary and Alliance Church, 125 S. Pleasant St.
E = Christ Episcopal Church, 162 S. Main St.
L = Grace Lutheran Church, 310 W. Lorain St.
M = First United Methodist Church, 45 S. Professor St.
O = Oberlin Calvary Baptist Church, 414 S. Main St.
Q = Oberlin Friends Meeting, Religious Life Center, 68 S. Professor St.
R = Rust United Methodist Church, 128 Groveland St.
S = Sacred Heart Catholic Church, 410 W. Lorain St. Seventh Day Adventist, 47832 W. Hamilton St. The Almighty Church, 47832 W. Hamilton St.
Glorious Faith Tabernacle, 45637 E. Hamilton St. The Church of God, 44 E. Lorain St.
Z=Mt. Zion Baptist Church, 47 Locust St.
Information prepared by Mary L. VanDyke for Oberlin Historical Improvement Organization (O.H.I.O.) to be used for the conference of The Hymn Society in the U.S. & Canada; July 11-18, 1996 in Oberlin Ohio. Click here to return to the mainpage of historical preservation in Oberlin.